Here at T3 we have scoured the vast reaches of tech-luggage-obscurity to find the best backpacks and laptop bags around. Whether you're looking for high-end designer backpacks or rugged, water-resistant rucksacks, we've got you covered. Both laptops and tablets are getting slimmer and lighter, so they're important investments that you need to protect. And while a sleeve or cover can be handy at times, nothing screams full-on protection quite like a backpack or laptop bag. You also need a means of carting around all your chargers, batteries, cameras, e-readers, selfie sticks, fidget spinners, and copies of T3 magazine etc. From stylish to monstrously rugged, these are the bags of gold. Whether you're looking for a new satchel for work or starting a new school term, choosing the right backpack is essential. Not only should it look good, but it needs to be comfortable, and, of course, be big enough to carry all of your stuff. Let's start off with size. Generally, a small backpack is around 6-10 litres. These are great for children, days out, and sports wear. A medium-sized daypack is around 10-30 litres, ideal for commuting. Over 35-litres and you're looking at overnight camping trips and backpacking expeditions. We're going to be focusing on daypacks in this feature, but you can checkout our guide to the best carry on luggage, if that's more your bag. Next, you need to decide the type of protection you need. Do you walk to work, come rain or shine? You might need a fully waterproof 'pack. If you want the ultimate protection, then maybe the North Face Access Pack, complete with exoskeleton, is more suited to you. Finally, comfort. If you're going to be lugging this thing around all day, you're going to want padded straps. Your shoulders will thank you later. Other comfort features to look out for are waist and chest straps. These aren't the last word in fashion, but they take the strain off your shoulders. It's stylish, durable, and affordable, what more could you ask for? The Austin backpack from Eastpak features a slightly more mature design than its famous Pak'R, making it ideal for University or your first job. It's made from hard-wearing nylon and has cushioned straps to ensure comfort, even when you're carrying the entire library on your back. There are two external zipped pockets and an interior padded laptop sleeve. 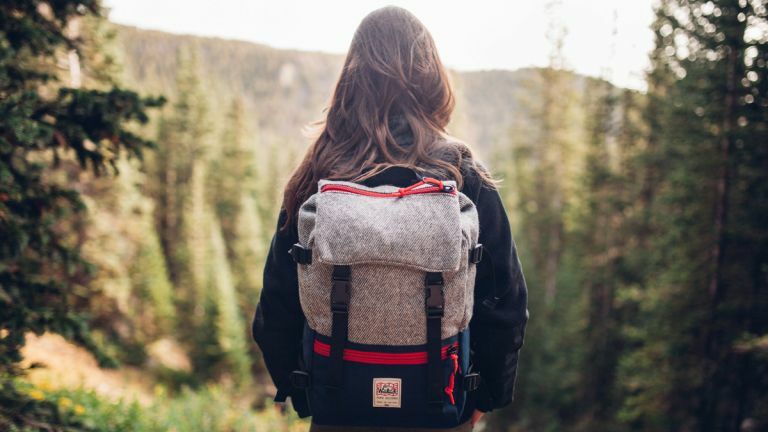 Best of all, Eastpak is so confident in the quality and durability of its backpacks that it offers a 30-year warranty. Made from 100-percent recycled polyester and treated with a polyurethane coating and a DWR (durable water repellent) finish - we really rate this pack from outdoor brand Patagonia. It's equipped with a padded laptop sleeve which doubles as an insulated hydration reservoir when you hit the trails, and features Human Curve shoulder straps which ergonomically fit your body. This Tom Ford backpack is a smart and practical item for your wardrobe, and could be paired with casual or more formal dress. It's made in Italy from velvet-soft nubuck leather, which actually grows even more supple with age. The sleek black leather is punctuated with bold, polished gold hardware. The interior is twill-lined, with enough space to carry your daily essentials. Want to walk around in style? Available in black or cherry, this slim full-grain leather and nylon backpack is perfect to carry around all day. The front's two zipped pockets take passports, phones and cards, but you'd be wise to store most about in the right-hand side’s RFID-protected pocket. Inside there's a compartment for a 14-inch laptop, another for a tablet, and a zipped pocket, though there's just enough room in its belly for an extra layer or a pair of shoes. It’s one for an overnight stay, or as a carry-on for inflight gadgets. This simple yet functional backpack from The North Face has several compartments to keep your gear safely stowed. With heritage North Face styling, this pack is as good-looking as it is practical for all your everyday adventures. It features a zippered main compartment and a secondary compartment for your smaller items. The design features a loop which you can hang a bike light from, and stylish two tone zip pulls. The Isar rucksack from Côte&Ciel is really two bags in one. First, there’s a laptop section, suitable for notebooks up to 15-inches, and second, there’s a separate, expandable section which is ideal for softer items such as a pair of running shoes and your running kit. Each of the two sections has a smaller zipped pocket inside for smaller items, and there’s a third, almost invisible pocket tucked between the two compartments that could be used to hold a passport or phone. The design is durable and very well made. The Isar is available in a range of colours and fabrics including water resistant nylon and full grain leather. It's ideal if you want to be able to commute with your laptop and your gym kit or perhaps a change of clothes if you are going straight out from work. Inspired by vintage forestry bags, this hardwearing 'Ranger' backpack from Filson is cut from durable twill (engineered to resist wear and tear) and canvas. We can see it looking like part of the set at Soho Farmhouse. It's the perfect bag if you tend to abuse yours. With approximately 22-litres of interior space, so plenty of room for a laptop, essentials, and a hoodie or pair of trainers. The straps are padded for comfort. The Pickwick 26-litre is a versatile canvas roll-top backpack with a design, which, according to Brooks "complements the ease that epitomises a urban journey by bicycle". It's made from water-resistant cotton and features genuine Brooks leather trim. The Pickwick has been designed by André Klauser in London and is manufactured in the hills of Tuscany by Italian artisans. There's enough space for a 15-inch laptop. The pockets and roll-top system close toward your back, maintaining a sleek appearance while keeping your belongings to safe. We love the clear, sophisticated design of this Paul Smith backpack. It's equally suited to carrying to business meetings as well as on weekend travels. The pack is made from black textured-leather, features a zipped pocket at the mesh-panelled back and striped webbing shoulder straps in a muted maroon, grape and navy shades. It's very subtle, and makes it that little bit more special than an all-black design. The canvas-lined interior features a tablet sleeve for storing electronic devices. Knomo's Southampton is deceptively roomy, even though its footprint it pretty small. We love the premium, leather and canvas design. The bag is separated into multiple sections, a back space with a padded laptop and tablet pocket, while the front part can hold plenty of cables, plus books and such like. Both pockets are protected by sturdy zips and the straps are notably comfy to wear for extended periods of time. It can be carried like a tote or worn like a backpack, so it's two bags in one, really. The Burton Tinder Backpack combines vintage styling everyday usability, and we think it looks great. The pack features a simple drawstring closure, which is great when you quickly need to whip out your laptop in a coffee shop, a padded laptop compartment, and a quick access accessory pocket. Yep, it may look retro, with it's vintage canvas and faux leather details, but this is a thoroughly modern backpack. It's built to last as well, with a lift time warranty. Going for that preppy look? The Herschel Heritage backpack is a classic, functional design that will treat you well. It's cut from canvas, with leather accents to add a touch of class. The pack is finished with a diamond-shaped accent and woven label. Inside features Herschel's signature striped fabric liner, and a 15-inch laptop sleeve. If you're after a backpack with a bold pattern, look no further than this pack from Cath Kidston. We really love the green and pink colour scheme printed on the waterproof oilcloth. It really stands out. Inside there's a padded section to keep your laptop secure, and plenty of room for A4 folders and essentials. Virgil Abloh, founder of Off-White is pretty bust right now, between his new job as Creative Director at Louis Vuitton, working on an IKEA collab, and partying at the Met Gala, he must be travelling around a lot. If you find yourself in the same position as Abloh, a sturdy backpack is a must. This Off-White pack is made from rugged canvas and features tough nylon straps. Inside there's enough space for a laptop, change of clothes, and other essentials. The backpack is tagged with a large Off-White logo. The Out of Office pack is a simple, stylish design which comes in a number of different prints - we love the Parrot m in the company's AW16 collection. Now more commonly found in the school playground than war zones, Eastpak has continued to be a market leader. The Out of Office pack is a simple, stylish design which comes in a number of different prints - we love the Parrot motif in the company's AW16 collection. The backpack features a separate laptop compartment, and shoulder pads with SGS. This Swedish outdoorsy firm was born from the idea of creating more a comfortable 'carrying system'. The Kanken, specifically, was created in 1978 to help prevent back problems among school children. This modern (yet still classic) backpack is stylish and practical, with space for a 13-inch Macbook (or smaller). The water-repellent body is built to last, and a carry handle wins points for simplicity and versatility. This backpack is named after one of the most secure places on the planet for a reason - because Tumi is known for its quality, durability, and all-around sturdiness. This pack is chunky and tough enough to keep your tech sleeping softly inside on a mountain climb, while still ensuring you look dapper for a lunchtime meeting. This backpack has a lot going for it – with a 35L capacity you can use it for your travels (cabin compatible too) and also as your commuter backpack, thanks to the TSA approved laptop sleeve, padded cable vault and multiple internal load organisation options. There really is a place for everything including tablet sleeve, phone pocket, security pocket, lower pocket that’s ideal for anything wet, dirty or smelly. There’s even a sternum strap with whistle key clip. Using this backpack makes being organised easy. The moulded back system makes the Cloud 35 comfortable to carry and encourages a good posture. As you can use for both travelling and commuting the price tag seems fair. Aimed at frequent business travellers. This formally-styled backpack from Samsonite measures 48x33x20cm and weighing 2.6kg, its takes 28 litres of gear, and includes compartments for a 10.1-inch tablet and a 17.3-inch laptop. However, it's how it works around the airport that impresses most; the backpack straps can be packed away, and it can be dragged around on its two wheels using a pop-up telescopic handle. It's also got a RFID-protected pocket to protect against payment and identity fraud through skimming of credit cards and passports. This 25-litre courier style backpack is practical and attractive, perfect for both communing and day trips. The large rolltop allows fast access to the main compartment which is divided with a large mesh pocket. There's also a laptop compartment, which can be accessed through a separate zip pocket (very useful for airport security). The internal laptop compartment is reinforced with a backplate to keep belongings protected, and the pack comes in four muted colours. Another great hybrid design, this bag has three compartments, two of which open exactly like a suitcase. The middle area has a zone for clothes that can easily fit a suit and other clothes, while there is a soft compartment behind it for a 17-inch laptop (or a couple of shirts). The front of the bag is of a more traditional backpack style, with organiser pockets for batteries, phones, pens and earphones. There's even a soft pocket for storing keys, coins, phones or sunglasses. It's all soft-sided, so it's not going to give your stuff much protection, but the whole bag can be reduced in size using a wraparound zip, while four compression straps keeps everything as small as possible. The North Face Access pack is perhaps the most advanced on this list - with a steel exoskeleton to keep your tech safe, and a shell design which pops open at the press of a button. It even 'ejects' your tech to make it more accessible. The pack features comfortable 'Flex Vent' shoulder straps. The contrasting yellow interior features four pouches and two zip entry pockets. It'll fit laptops up to 15-inches in size. This beauty makes easy work of a bike commute – the trampoline suspended mesh backsystem meant that we arrived at our destination without any dreaded wet patches on our back. The pack sits comfortable and moves closely with the body making it comfortable to ride in and also to run with – the ventilated stretch yoke and load lifters on the harness combined with the elastic hipbelt certainly do their job. This good looking backpack, complete with reflective details for visibility at night, has loads of little compartments for stashing and separating your stuff, as well as a padded laptop and tablet sleeve. We like the built-in high vis raincover and LidLock helmet attachment too – it’s very well designed and made. If you need a backpack you can travel with which will keep your gear dry even if it takes a swim, Patagonia’s Stormfront Pack is it. Canyoneers, canoeists, anglers and photographer on the go spring to mind immediately. 100% nylon, 100% waterproof welded construction and an easy-to-use, fully waterproof TIZIP main zipper protect the interior of the pack. The 30L backpack itself is ultra-simple – one large main compartment with a little mesh pocket and an external, water-resistant stash pocket. It’s really comfortable to carry with adjustable, low-profile padded shoulder harness and removable waist belt. A brilliant choice if you need the 100% waterproofing, if not then it’s very expensive for what is essentially a very well made yet basic bag. With a sturdy toll-top this backpack is 100-percent waterproof (Class 3 - IP66). It floats safely if dropped in water, and will also protect your kit from dust, sand and dirt. It's comfortable, too, with lightweight straps which have a ventilation system, as well as adjustable sternum straps and waist straps.